Abstract: Time correlations always exist in modern geodetic data, and ignoring these time correlations will affect the precision and reliability of solutions. In this paper, several kinematic data processing methods for time-correlated observations are studied. Firstly, the method for processing the time-correlated observations is expanded and unified. 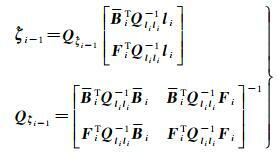 Based on the theory of maximum a posteriori estimation, the third idea is proposed. Two types of situations with and without common parameters are both investigated by using the decorrelation transformation, differential transformation and maximum a posteriori estimation solutions. Besides, the characteristics and equivalence of above three methods are studied. 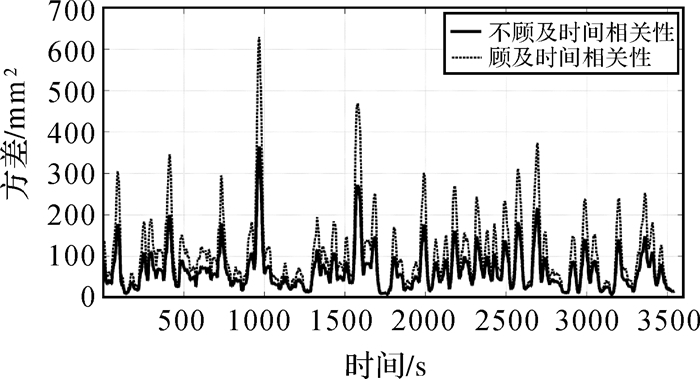 Secondly, in order to balance the computational efficiency in real applications and meantime effectively capture the time correlations, the corresponding reduced forms based on the autocorrelation function are deduced. Finally, with GPS real data, the correctness and practicability of derived formulae are evaluated. 黄维彬. 近代平差理论及其应用[M]. 北京: 解放军出版社, 1992. HUANG Weibin. Modern Adjustment Theory and Its Application[M]. Beijing: PLA Publishing House, 1992. 杨元喜. 自适应动态导航定位[M]. 北京: 测绘出版社, 2006. YANG Yuanxi. Adaptive Navigation and Kinematic Positioning[M]. Beijing: Surveying and Mapping Press, 2006. 李博峰. 混合整数GNSS模型参数估计理论与方法[M]. 北京: 测绘出版社, 2014. LI Bofeng. Theory and Method of Parameter Estimation in Mixed Integer GNSS Model[M]. Beijing: Surveying and Mapping Press, 2014. ZHANG Zhentao, LI Bofeng, SHEN Yunzhong. 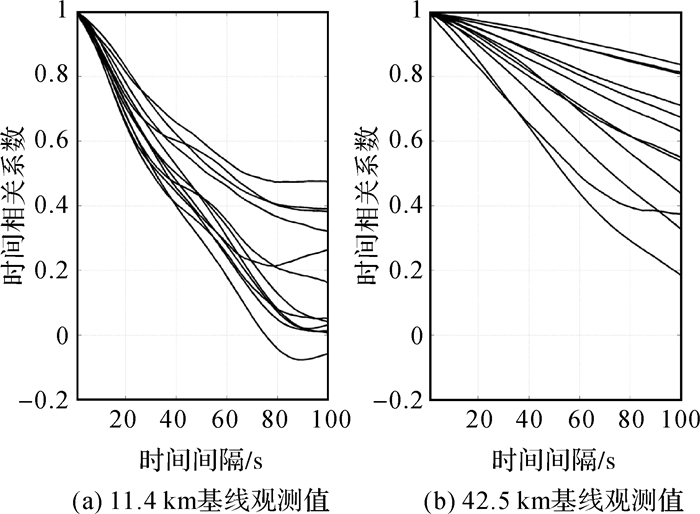 Comparison and Analysis of Unmodelled Errors in GPS and BeiDou Signals[J]. Geodesy and Geodynamics, 2017, 8(1): 41–48. 黄贤源, 隋立芬, 范澎湃. 有色观测噪声的随机模型级数表示及其补偿法[J]. 武汉大学学报(信息科学版), 2008, 33(6): 644–647. HUANG Xianyuan, SUI Lifen, FAN Pengpai. A New Approach for Colored Measurement Noises by Correcting Random Model[J]. Geomatics and Information Science of Wuhan University, 2008, 33(6): 644–647. 林旭, 罗志才, 许闯, 等. 有色噪声的自协方差最小二乘估计[J]. 测绘学报, 2013, 42(6): 804–809. LIN Xu, LUO Zhicai, XU Chuang, et al. Autocovariance Least Squares Estimation for Colored Noise[J]. Acta Geodaetica et Cartographica Sinica, 2013, 42(6): 804–809. 杨元喜, 徐天河. 基于移动开窗法协方差估计和方差分量估计的自适应滤波[J]. 武汉大学学报(信息科学版), 2003, 28(6): 714–718. YANG Yuanxi, XU Tianhe. An Adaptive Kalman Filter Combining Variance Component Estimation with Covariance Matrix Estimation Based on Moving Window[J]. Geomatics and Information Science of Wuhan University, 2003, 28(6): 714–718. 崔先强, 杨元喜, 高为广. 多种有色噪声自适应滤波算法的比较[J]. 武汉大学学报(信息科学版), 2006, 31(8): 731–735. CUI Xianqiang, YANG Yuanxi, GAO Weiguang. Comparison of Adaptive Filter Arithmetics in Controlling Influence of Colored Noises[J]. Geomatics and Information Science of Wuhan University, 2006, 31(8): 731–735. 宋迎春, 朱建军, 陈正阳. 动态定位中测量噪声时间相关的Kalman滤波[J]. 测绘学报, 2006, 35(4): 328–331, 341. 薛树强, 杨元喜. 连续观测系统的平差模型与有色噪声补偿[J]. 测绘学报, 2014, 43(4): 360–365. 赵长胜. 有色噪声滤波理论与算法[M]. 北京: 测绘出版社, 2011. ZHAO Changsheng. Colored Noise Filtering Theory and Algorithms[M]. Beijing: Surveying and Mapping Press, 2011. 胡国荣, 欧吉坤. 改进的高动态GPS定位自适应卡尔曼滤波方法[J]. 测绘学报, 1999, 28(4): 290–294. 赵长胜, 陶本藻. 有色噪声作用下的卡尔曼滤波[J]. 武汉大学学报(信息科学版), 2008, 33(2): 180–182. ZHAO Changsheng, TAO Benzao. Kalman Filtering of Linear System with Colored Noises[J]. Geomatics and Information Science of Wuhan University, 2008, 33(2): 180–182. LI Bofeng, SHEN Yunzhong, XU Peiliang. Assessment of Stochastic Models for GPS Measurements with Different Types of Receivers[J]. Chinese Science Bulletin, 2008, 53(20): 3219–3225. 杨元喜, 崔先强. 动态定位有色噪声影响函数——以一阶AR模型为例[J]. 测绘学报, 2003, 32(1): 6–10. El-RABBANY A E S. The Effect of Physical Correlations on the Ambiguity Resolution and Accuracy Estimation in GPS Differential Positioning[D]. Fredericton: University of New Brunswick, 1994.